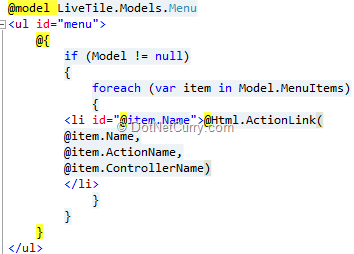 Abstract: By default ASP.NET MVC Project Templates come with a Menu that is hardcoded for each controller. However in a real-life scenario, more often than not, we need our Menus to be dynamic and loaded and managed with certain amount of flexibility. 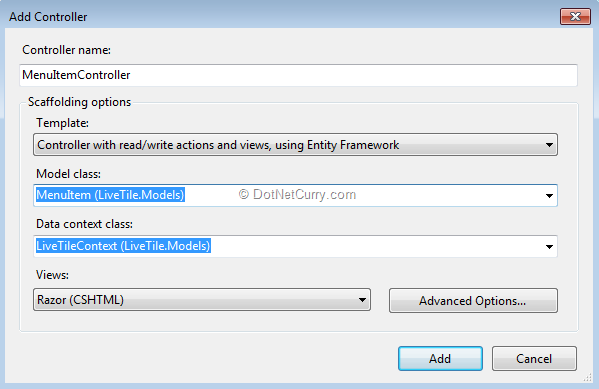 In this article, we will see how to create a single level Dynamic Menu using EF code first and jQuery in an MVC Application. Default static ASP.NET MVC Project Templates are a good starting point, however projects with even medium complexity need certain amount of flexibility. In this article, we will create a simple single level menu system that will group child menu items and give the flexibility of setting the Label, Action and Controller names at run-time. We will use SQL Server to store and EF to manage the Menu definitions. Our schema is as follows. The Menu class is our container or logical grouping for MenuItems. 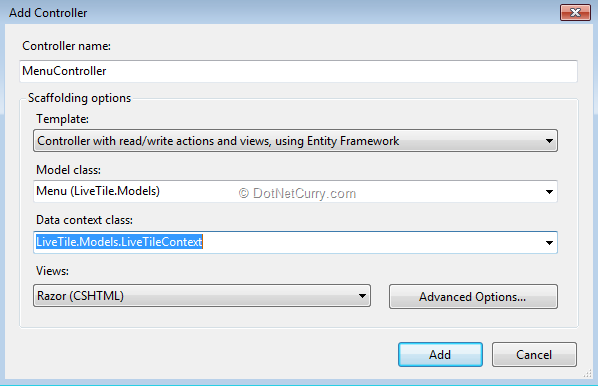 Url – If Action Name is empty, one can provide a direct URL that the menu should point to. We persist them in SQL Server using EF Code First. 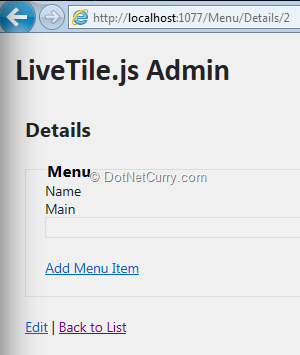 We start off with our LiveTile project that was built from an empty MVC4 project. It has only got Index.cshtml under Home. We will build the Administration as well as the Menu on top of this. Step 2: We create a Controller using the standard MVC Scaffolder that we can bring up by Right clicking on ‘Controllers’ folder and selecting ‘Add Controller’. - Click on Advanced Options and select _LayoutAdmin.cshtml as the master page. This is important because we want the menu to be cached for regular pages that use the default master pages. On the other hand the Admin page will be setup to not use any caching so that changes to the Menu are reflected immediately. - Finish the Controller creation by click the ‘Add’ button. 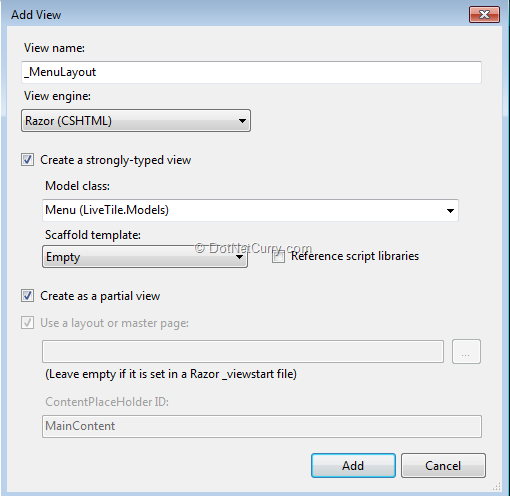 This will scaffold all the methods and views required for Menu creation. 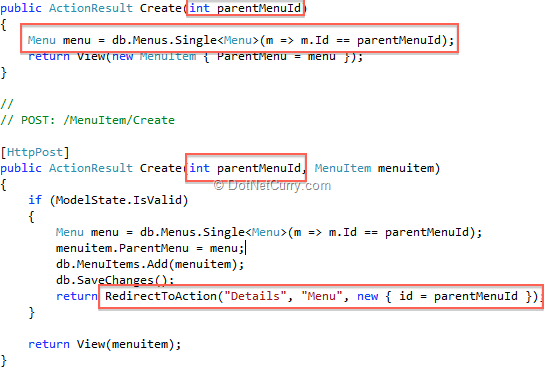 Now we repeat the same for MenuItem and create a new controller MenuItemController using the same Data Context and the Admin specific master page. 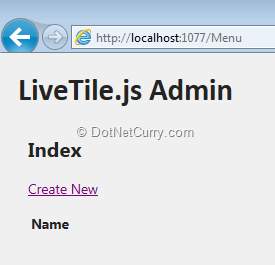 Step 3: Next we update the connection string in the web.config by changing the Name to LiveTileDB and the connectionString to point to the correct catalog. 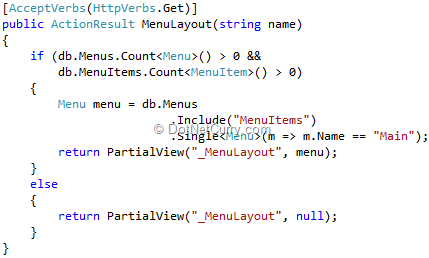 Step 4: Then we update the DBContext such that it uses the correct connection string. As seen below, we pass it to the base in the Constructor. We have also overridden OnModelCreating and passed it the Initializer ‘CreateDatabaseIfNotExists’. This ensures EF simply creates the DB if it does not exist. Step 5: MenuItems don’t really exist on their own, they HAVE to be a part of some Menu. So let’s delete the MenuItem\Index.cshtml. We are adding the rendering details for MenuItems in the Menu\Details page itself. Not only that, for each MenuItem, we are setting up the Edit and Delete action link that will enable us to Edit and Delete the MenuItems from the Details page itself. At the bottom we have also added the ‘Create’ MenuItem Action link. Click on Create New and add a new Menu called ‘Main’. Click on the Details to get to the Details page. Click on Add Menu Item and add a MenuItem with Name = Home, Action=Index, Controller=Home. So now our backend is all set with a Menu and a few MenuItems. Time to get the rendering work in place! Step 1: Add a Partial View called _MenuLayout.cshtml under the Views/Shared folder. Make it Strongly Typed of type Menu. Thus the Menu is nothing but a List with each menu item being a list item. This will be called to generate the PartialView of the Menu. Here we have ‘hardcoded’ the Menu name (‘Main’). The method returns just the HTML for the _MenuLayout.cshtml file with the given Model (menu). Add a <nav> section with an empty div with id navcontainer. We will replace the contents of this div with the partial view. 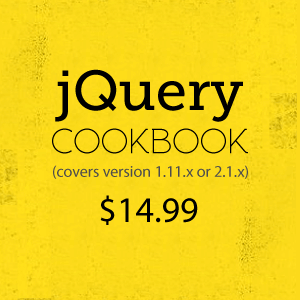 This script is nothing but a jQuery postback, it is fired once the document is loaded. 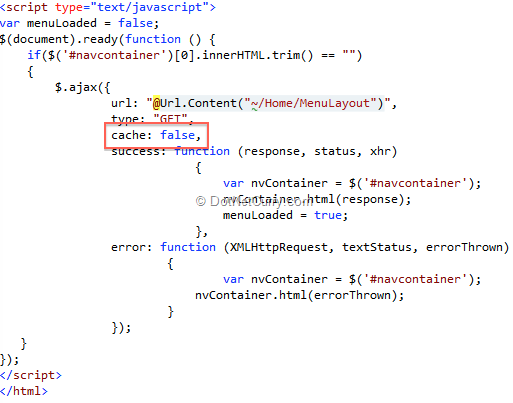 And on a successful return ,it simply dumps the response HTML into the container. Step 6: Prettify it by updating the CSS for converting the <li> elements into a Tab layout. That’s it, we are done. Run the Application to see the Menu getting rendered. Navigate to the Admin page at /Menu, make some changes to the Name of the MenuItems and see them getting reflected immediately. Clicking on the Home link will navigate back to Home page. Clicking on About will throw an error because we don’t have an About page yet. With that, we conclude this post. 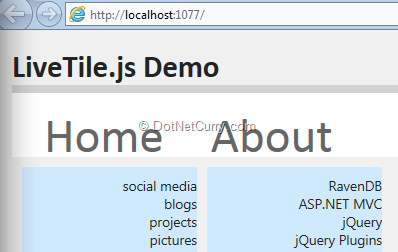 We saw how to create the backend and related admin screens for a simple Menu system for an ASP.NET MVC 4 application. We also saw how MVC partial views are used, how to deal with Master-Child UI by passing the Master’s Id around and last but not least, how jQuery can be used to do partial postback. Yup, since it's open to modifications, if you change the Menu name from the default "Menu" it goes off the rockers. Simple fix to test it out is to have atleast One top level Menu's Name set as 'Main' :). I just fixed it back. Thinking of Blocking users from making changes to 'Main' Menu :-). Or adding a admin page to allow them to select their top level Menus :-). We have had to disable Add/Edit/Update/Deletes on the Demo site because of XSS attacks. We get it the current code does not use Anti-XSS best practices, if we were to include all best practices of web development in every demo we did, the essence of the article would get lost. It's a demo, let it remain one. Code and idea is really great! You can add, additional attributes in the MenuItem for saving. To get those information in the menu like, look at Step 2. 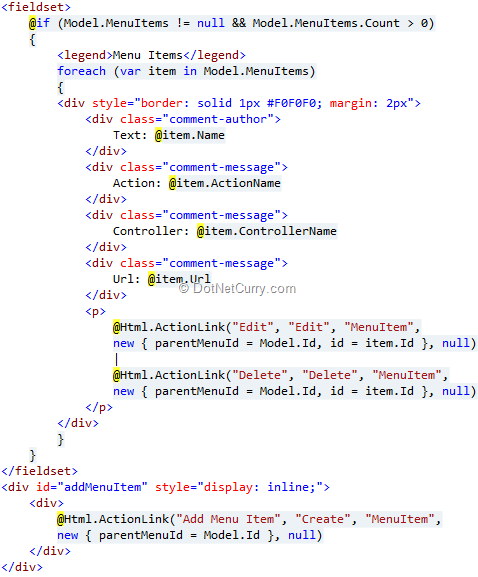 We are creating the Menu links using the Html.ActionLink(...). There is an overload to specify an anonymous object with name/value pairs that will be passed as query string. Use that overload to pass the additional information. Nice and Thank you very much Sumit. How do I sort the menu items in either the menuitemcontroller or menulayout.cshtml? How does one pass the ParentMenu ID to the Menuitems list in a seed() method? In "Rendering the Menu", Step 4, when you say "update the _Layout.cs", do you mean _Layout.cshtml? And in Step 5, is it _LayoutAdmin.cshtml, not _LayoutAdmin.cs? One of the best navigation examples I have seen. I often wonder why there couldn't be a starter template with this kind of system. Btw. 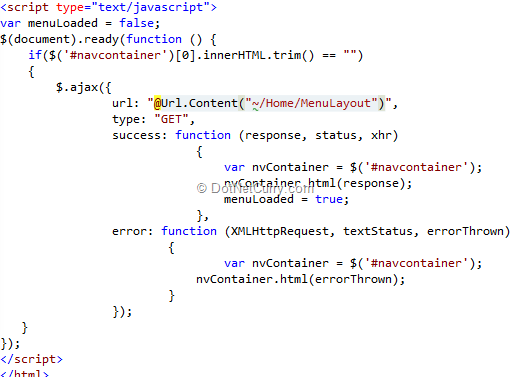 Why using jquery rather than a Html.Action or Html.Partial? plzzz suggest me steps for create a menu. I get a Newtonsoft exception visiting your live demo. However, instructional web site. Thank you. When I click on "See a Live Demo" it blows up.